Your local full service real estate agent that will save you a ton of cash when buying or selling your Washington D.C. home! Our agents are determined to help millennial buyers expertly navigate the Washington D.C. market. Glass House is a team of agents and trusted industry professionals that sell about 5X more homes than the average agent in the D.C. area. We are adding more qualified D.C. agents to our team on a regular basis in order to make an effort to be your local full-service agent that helps you save a ton of cash! Since 2010, Glass House has rebated home buyers over $3,000,000 with the average rebate amounting to over $10,000. Our sellers have saved an average of $7,500 in listing commission. At Glass House our primary responsibility is to help clients identify value and negotiate a great deal. Our full time field agents and transaction coordinators show homes and manage transactions so that we can focus on what really matters when buying and selling a home. We take negotiating seriously and it shows, 80% of our clients are referrals or repeat customers. With over 400 transactions since 2005, few agents have as much experience and respect from the Real Estate community. A cash back rebate when buying or selling your home. When buying your home with Glass House you can expect a streamlined transaction. We only ask that you identify the homes you want to see and get pre-approved with a local lender. Once you find the homes you're interested in viewing, Glass House steps in and offers full service representation. We charge a 1.5% flat commission or $5,000, whichever is more. The remaining commission is rebated back to you. Interested in selling your home with Glass House? Contact us and one of our full-service agents will come to your home to give you an expert market analysis of your home's value and the current market. There is absolutely no obligation to work with us, just a friendly meeting in which you will get a ton of information about the market for your home. 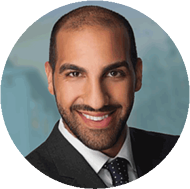 "We sold our townhouse and bought a single family home through Khalil, and both experiences were equally impressive. He said that if there's something that he's not the best at, he'll hire the best, which is what he did; he got us the best photographer and the best stager. He also invested in advertising, paying to have ours as a featured listing on all major realty sites and Facebook. "